For much of last night, I was wearing an American cheese mustache in lieu of eye black. Can someone please explain the meaningful difference between the following stories? 1987: Oral Roberts goes on vigil and asks for $8 million, or else God will call him home. 2008:Chrysler CEO Robert Nardelli, Ford CEO Alan Mulally, and General Motors CEO Rick Wagoner go to Congress and say they will go out of business unless Congress loans them at least $25 BILLION (yes, BILLION). Okay, I'll give Ford some credit: at least they say they can weather the storm without dying. These clowns make garbage cars like Hummers and Expeditions for years, knowing full well the long-term consequences for the planet. Then, when the bottom falls out, they come asking for help. Go bankrupt, you wussies. Man up. Market up. And it takes the cake that Dubya and his minions want to loan the car clowns money that was previously earmarked to reward companies for building more fuel-efficient cars; but of course Dubya wants to remove that pre-condition and just fork over the money. Dubya, who fired no one after 9/11 or the federal levee failures. Dubya, the MBA President. Dubya. What a joke. The only way he could be worse is if he pardons Edwin Edwards. Oh, that's right. Apparently, he's gonna do that too. Go here to see the trailer for the new Trek film (see Trailer #2). Kirk and Spock in a fist fight? Gotta see this. Norton's Character: If you could fight any celebrity, who would you fight? Norton's Character: Doesn't matter. Who'd be tough? Norton's Character: Shatner, I'd fight William Shatner. I just want to thank the chuckleheads in St. Tammany Parish who helped Louisiana make national news by perpetrating a Klan murder. I picked up the Times-Picayune this morning and thought I was in a time warp to 1934. Somehow, "O Brother Where Art Thou" doesn't seem so funny anymore. WWL Radio's website was quick to try to reassure us that there is no organized KKK activity in St. Tammany. You know, because WWL needs to help its listener base keep their cover. Lovin' Me Some Trek "A-Team" and "Love Boat"
1. The state and the Saints are close to a deal to upgrade the Superdome, keep the Saints here, and attract a Super Bowl. 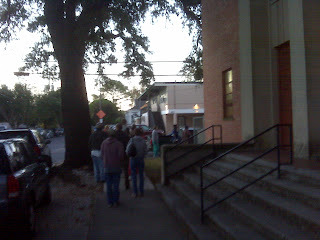 Dr. Mrs. Clio and I went to vote at 6:05 a.m., and you see above what we found. 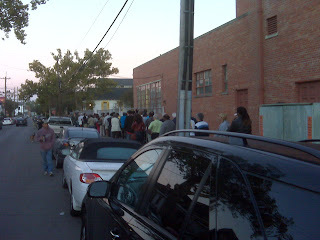 That's a line that stretched out of the Xavier Prep parking lot and all the way around the block. Normally we walk right into the cafeteria and stand behind maybe one person. In other news, my sense that Lusher kids are not really representative of the general population was confirmed when Cliette told me the voting results from her homeroom: 20 votes for Obama, 4 votes for Nader, 1 vote for McCain. Fifth graders, I think, tend to vote in packs--once the tipping point is reached for one candidate, they all go like lemmings. I really am stirred up about the dawn of something new, or renewed, in the United States of America. If we really are a nation of entrepreneurial, pioneering spirit, we have our chance to do something special now. I haven't done much blogging lately, but I want to say that I think Americans have had a better choice in this presidential election than in any election in my lifetime. I think McCain vs. Obama is the best choice since Eisenhower vs. Stevenson in the fifties (and that was WAY before my lifetime). I really regret that McCain made such a horrible choice in Palin; I attribute that to too much listening to Dubya political operatives. I hope that after today, Governor Palin takes her rightful place as a talk show host on Fox News, giving Oprah a run for her money. I'm pretty much over being bitter about President George W. Bush, and I am really happy that we can move past the last 8 years of a presidency marked by a deep cynicism about Americans and a frighteningly wrong mix of evangelical end-of-days-ism and power politics. I think that just as we in New Orleans are creating and re-creating something better, Americans can too.